In this article, we'll cover the public bus service, the "Tourist Bus", the regular bus services and the Night Buses and the various options available for getting around Madrid by bus. If travelling around the city underground on the Metro isn't your preferred option, the bus service that's run by the EMT (the Municipal Transport Company of Madrid) provides a wide range of vehicles that reach every corner of the city, including some areas that are not covered by the Metro. Choosing to use the bus network does have one disadvantage: the traffic. Despite the capital having bus lanes on many of the city's streets, the heavy traffic at certain times of the day can lead to delays and of course, there are occasions when you may find that the buses are extremely crowded. However, travelling around the city by bus is highly recommended if you want to see as much as you can of Madrid and if you are intending to focus mainly on the city centre. The connections are very good and the buses run frequently too. Of course, there will be times when you need to be patient which is one of the normal disadvantages of choosing to use the bus network. Information regarding the bus routes can be found at each stop and at some of the stops, there is a screen advising the expected waiting time until the arrival of the next bus. When it comes to stopping the vehicle, all you have to do is to raise your hand so that the driver can see you and he will stop for you. When you want to get off, you just need to press the stop button that you will find on the hand-rails inside the vehicle. There are plenty of routes that travel to evey corner of the city. The majority of the services run from 06:00 until 23:30 at night from Monday to Friday and from 07:00 to 23:00 on weekends and Public Holidays. The frequency of the buses during the week ranges from 4 to 15 minutes, which depends a lot on the traffic at the time. On Saturdays and Sundays, the buses are less frequent. There is also a night bus service which is known as the "búhos" (owls, in Spanish). This service covers twenty six different routes all departing from the Plaza de Cibeles. However, their frequency is significantly less than the service which runs during the day time. From Friday to Sunday, the buses depart every 35 minutes from 23:55 until 04:00 in the morning. The last bus departs at 05:10 a.m. On Saturdays and on the eve of a public holiday, the service runs every 15 to 20 minutes from 23:00 to 07:00. The cost of a one-way ticket on the bus is €1.50 and you can buy your ticket when you get onboard the bus. For other types of tickets, the prices operate in the same way as for the Metro. This means that you will need to have a multi-ticket (Tarjeta Multi) whether this is for the tourist rates or for a ticket that you can top-up for 10 journeys. This type of ticket option, which can be used by different people and can be topped-up, cannot be purchased on the buses, they can only be bought at the Metro stations or at a tobacconists. If you buy the tourist rate ticket, then the card is supplied for free and afterwards, you can just top it up with individual journeys or for 10 journeys which costs €12.50. Otherwise, the card costs €2.50. Inside the buses you will find a machine where you can validate your ticket. 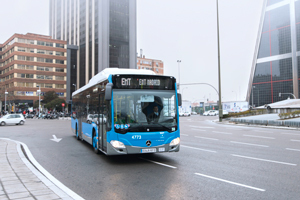 In addition to the Number 200 and 101 buses which connect the city with the airport from Avenida América and Canillejas respectively, there is also a special service that brings travellers right into the centre of Madrid. This is the bus that is known as the Airport Express ("Exprés aeropuerto") which is easily recognisable thanks to its bright yellow colour. This service operates every day of the year, 24 hours a day. The journey time is around 40 minutes maximum to Terminal 4 (T4) and takes just half an hour to reach Terminal 1 (T1). These buses tend to run every 15 to 20 minutes during the day time and every 35 minutes at night. The places in the city where the bus stops are: Atocha, Cibeles and O´Donnell and the cost of the journey is €5.00 which is payable on board the bus.